Congratulations to Daniel Marino on achieving his Instructor Award! Daniel has put in a lot of work in achiving this award; including traveling all the way to the UK to train with me! Iain Abernethy Residential Courses 2019! NOW SOLD OUT! Demand is always high for our residential courses and, as is only right, first refusal is always given to previous attendees. This means that in 2019 only TEN places will be available to new people! There would have been none, but we have put on an extra date to help meet demand. My good friend Axel Siebert recently competed his full instructor award! Axel is very knowledgeable martial artists who approaches karate in a very practical way. Congratulations to Will Wright on completing his full Instructor Award recently! These courses are by invitation only and involve a lot of research, two written papers and a multilayer practical assessment. To pass, people have to show good understanding of my general approach (as distinct from the specific method I teach to my personal students) and have demonstrated the ability to communicate that approach while integrating it into what they do. Congratulations to Daniel Marino on achieving his Introductory Instructor Award! Karate Throws Volume 1 is is now available in all formats! Karate Throws Volume 1 is now available on Download, DVD, and with App Subscription! There’s also a YouTube version if you prefer! Karate Throws and Takedowns DVD on the app now! A couple of weeks ago I spoke to Jeremy Lesniak of Whistle Kick Martial Arts Radio! It was a conversation quite different from others I’ve had. We covered many topics I don’t normally get to talk about. We talk about martial arts and life, the fear I felt in early training, mistakes I have made, my rebellious streak vs. The 2.0 version of the app is live! The 2.0 version of the app is now live! The new interface looks amazing and takes into account all the great feedback we have received from users. You can now register from within the app and it is also possible to subscribe via iTunes! Congratulations to the following who have completed their Instructor Awards recently! All five gents did a superb job! Congratulations to the following who have completed their Instructor Awards recently! I only run these courses once every four or five years and it takes a lot of research, two written papers and a multilayer practical assessment to get through it. All have shown a good understanding of my general approach (as distinct from the specific method I teach to my personal students) and have demonstrated the ability to communicate that approach while integrating it into what they do. I would therefore recommend them to others wanting to understand the nature of kata bunkai. Iain Abernethy takes on 4 questions at the Martial Arts & Life podcast studio in Seattle. Over the last few months we have had people from Germany, UK, USA and Switzerland achieve instructor status! These are all experienced martial artists who have their own well established and effective approaches. The instructor programs I run are not about getting people to do exactly as I do, but to acknowledge that those who participate understand my general approach, and are people that I would recommend to others wanting to understand the workings of kata in combat. They are all good people who have worked hard, studied deeply, and who really know their stuff! Congratulations to Cla Gleiser (Switzerland) for recently grading to second dan WCA under Nick Hofele 4th dan WCA (who in turn graded under Iain Abernethy). The grading took about 2:45 hours and involved kihon, kata, bunkai, pad-work, grappling and life sparring. It was a tough test and we are all very proud of Cla! Over the last few months a few members of the tribe have achieved instructor awards! These are all experienced martial artists who have their own well established and effective approaches. The instructor programs I run are not about getting people to do exactly as I do, but to acknowledge that those who participate understand my general approach, and are people that I would recommend to others wanting to understand the workings of kata in combat. They are all good folks who know their stuff! I was recently on episode 88 of The Kung Fu Podcast! I hope you enjoy listening to mine and Tim’s wide ranging talk! 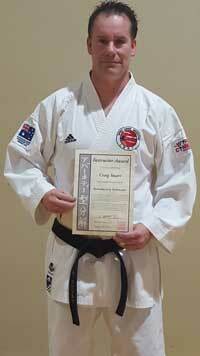 Craig Stuart becomes the first person in Australia to complete Combat Coach Programme to Instructor Level!